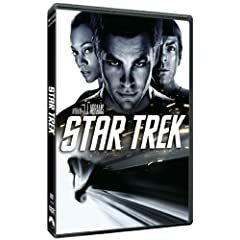 Star Trek fans should be happy tomorrow with the 2009 feature film on store shelves in a variety of formats, along with The Best of Star Trek: The Next Generation, Vol. 2 and The Best of Star Trek: The Original Series, Vol. 2. Other feature films of note out tomorrow include Jim Jarmusch's The Limits of Control and the Criterion Collection release of Downhill Racer. The complete (four season) Farscape series is in stores tomorrow, as are the individual seasons. The complete HBO series Rome is also available tomorrow, as is a repackaged complete collection of the Sopranos. Modern classics Fight Club and The Professional are available in Blu-ray format this week as well as Kevin Smith's Chasing Amy and Clerks.